96″ x 89″ x 5″. Ocean plastic from Greece, California, Alaska, Hawaii, and Costa Rica. This work updates an ancient Greek sculpture of the complex mythology of Laocoon, a priest of Poseidon who warned of the danger of the Trojan horse, and was thus punished by an attack of two sea serpents sent by Poseidon who killed his two sons. Seen as the symbol of a ‘voice of warning,’ Longobardi’s Newer Laocoon gives voice to the ocean, now sending plastic back to us to warn us of its damaging effect and her state of ill-health. 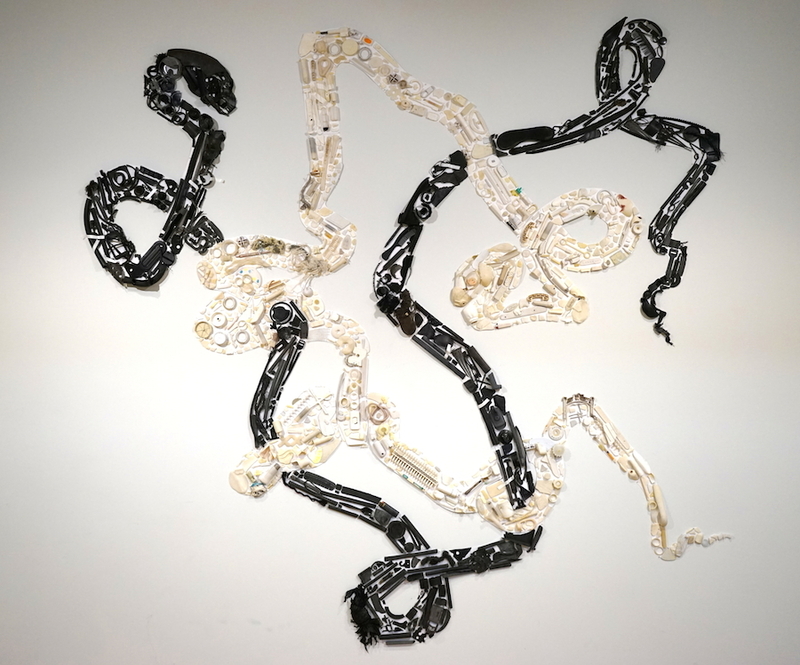 Longobardi envisions black and white serpents representing a balance evocative of the yin-yang symbol as a necessary next step in humanity’s realignment with nature.